Skyscript.co.uk :: View topic - Trying to make sense of this demonlogist's world view. Trying to make sense of this demonlogist's world view. Posted: Sun Apr 08, 2018 1:54 pm Post subject: Trying to make sense of this demonlogist's world view. This video popped up on my youtube suggestions and I ended up listening to it all. My mind was struggling to deconstruct what he was saying. Also half way through I was getting bored and wanting something philosophically deeper and from at least two sides of the argument. I am not religious at all but I can go along with the Gnostic Christian view that Jesus died and resurrected so that we don't die but have eternal life. I found what he was saying curious and the sigils interesting, but felt he wasn't dealing with the negative side of what these things can do? I was wondering if his way of seeing the world is what lies behind all the suffering and ugliness in the world. I was thinking if Raskolnikov in Crime and Punishment had conjured a demon he would never have been caught or his soul saved? I was wondering if these demons are the same as the reptilians that David Icke talks about, that operate in our world through some humans? Does all human achievement and power only come through association with these things, or is it intrinsic to human beings? Is what these things can give the only way to say intellectual understanding? Is it better than what a human being can do by itself? David Icke always emphasises that humans are much more intelligent and powerful than the reptilians. David Icke also says that these reptilians have been worshipped as Gods all over the world since antiquity, so when the man in this video says that they are ancient Gods, they seem to be describing the same thing just with a different attitude towards them. They do seem to mostly be ancient middle eastern Gods. Some of the descriptions the man gave reminded me of another youtube video I had ended up listening to where a Christian man who had belonged to some special task force said he was transported by God to Rome and encountered a demon in an underground place down stone steps, and it roared at him what was he doing there. I was also wondering about the David Icke video about Saturn that ModWasp linked to, where David Icke claims that Saturn was built by these reptilians to control us with its energies. As an astrologer, I do think that the planets affect us and I don't think humans, with or without demonic help, could influence things. Maybe I agree with David Icke that some humans are born with the DNA (astrological chart) to be affected by these things. Out of curiosity, here is Julius Evola's chart. It is a noon chart as I do not know his time of birth. 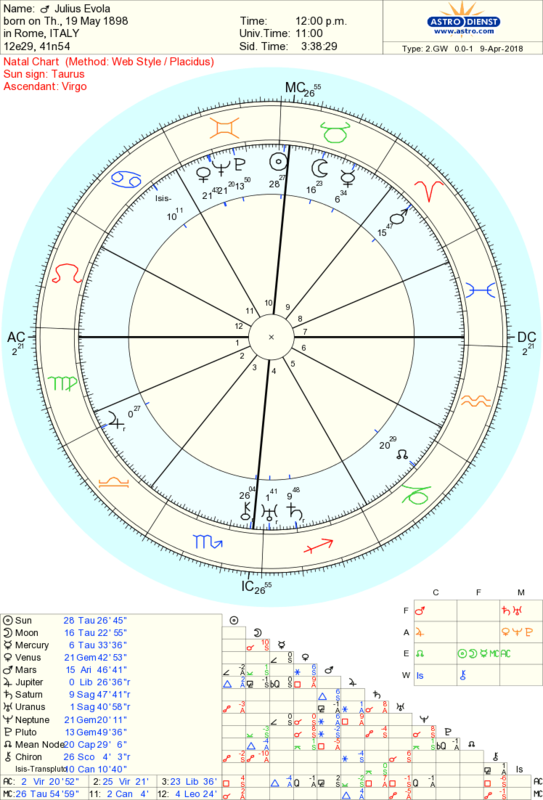 Just to try to get some idea if he was any other than what is described in his chart or the events of his life any other than the transits and Solar Arcs, or any other astrological system you use, describe. Just from the Wikipedia article about him, there doesn't seem to be any evidence that he was invoking demons; he seems to have been a philosopher and artist with strong feelings about some things such as the way history was happening around him, modern life and modern art. An intellectual aristocrat. His natal Mercury is less than one degree from its station to go direct on 15th May 1898 at 5 degrees Taurus 39 minutes, so he was probably an intelligent man. Julius Evola was not a demonologist, unlike his older contemporary Aleister Crowley, although both men's works on Magic and other topics are controversial among esotericists. BTW, somewhat confusingly, Astrodatenbank gives an AA Rodden rating for the 12:00 p.m. birth time that you have used for his noon chart, although another source I checked out calls the birth time unknown. I have read several of Evola's books. He was an extreme traditionalist, to be sure, as evidenced by Sun, Moon and Mercury being in Taurus. Their position in Equal 9th (if the birth time is to be trusted) makes sense, since his Traditionalism was tied to his spirituality; it was based on an idealized view of ancient and medieval thinking. Just imagine a patriarch from Game of Thrones incarnated in more modern times, and you get the idea! The Sun (along wih some planets) in Placidus 10th and conjunct the MC respectively would be note-worthy too in regards to Evola's Aristocratic nature. He indeed sided with Mussolini, as he was hoping for a revival of the Roman empire, but he always remained an independent thinker, not withholding his criticism of the Fascists when he realized they fell far short of his lofty aspirations. Which may have been the reason why his books were blacklisted in war-time Germany. A prolific writer and certainly not lacking intelligence, he was a harsh critic of numerous aberrations he saw in the modern age. Some of his ideas were one-sided and over the top, in my view; while there are others that I agree to and resonate with. Especially, I found his understanding of esoteric symbolism very profound, e.g. in his treatments on the Holy Grail and on Hermetic Alchemy. Some of his insights he had gained without a doubt from his years with Ur, a group of Italian esotericists, who, according to their own statement, passed on a body of 'neo-Pythagorean' knowledge. There is much one could say about this elusive and colourful personality and his chart. I would certainly be open to a discussion, if somebody here is interested. How strange, yes Astro data bank does give 12 noon an AA rating, time from birth certificate. I would be interested in discussing this interesting person further. I need to research him more, as before looking him up after listening to the youtube video I had not heard of him before. I doubt he was as the youtube video portrayed him. I thought they dusted serious issues too lightly.